Roberto Y. (Chicago, IL): I didn’t expect Canelo to finally take the fight with Golovkin, and I’m actually very shocked that he did. Now that a date is set, can you share your thoughts on this fight and who has the best chance to win? Vito W. (ESB): I think this fight is incredibly great for Boxing. In an era of the sport where mega fights don’t always live up to the hype, I think this is one of those bouts that you can firmly etch in stone as a candidate for “Fight of the Year” and never think twice. These two gladiators leave it all in the ring, and they never disappoint. Whether you like them or not, you have to respect the both in such a manner. Taking a glance at both men, I think there are strengths and weaknesses to be derailed and explored. Beyond that, you have the typical stuff to contend with between the two of them as well, such as size dynamics. One thing I noticed when Golovkin got in the ring after the Chavez Jr bout was how much bigger Golovkin is than Canelo. For years, Golovkin got a pass for being “too small to go up to 168 to face Andre Ward”, yet in the ring, standing against a fully hydrated Canelo that was fighting at a weight he has never entered the ring at (164lbs), Golovkin was much bigger. If there was ever any question before, it was answered as we gazed at that spectacle in the ring last Saturday night. Golovkin is clearly the bigger fighter, and this has been my knock on him in the past. Basically, his decision not to test himself against men his size; but instead, face men who have to come up to his comfort zone. All that said, I still don’t look at it as a way to negate a victory over Canelo if Golovkin is able to pull it off, because when you’re talking about skills, being this close in weight/size proximity makes it all a wash.
Golovkin will enter the ring with a bit of a size advantage. Aside from that and power, I think all of his advantages stop. I think Canelo is the faster fighter, and contrary to what many believe, I think he’s also the more offensively gifted fighter. Golovkin’s offense is solely based on power and stalking. The jab of Kell Brook was able to pause him, temporarily. As offensively deft as Brook is, one could argue that he isn’t as fluid with his punches as Canelo and was a bit easier to hit. Canelo will present a few wrinkles that Golovkin struggles with, namely body work. The flipside is that Golovkin will represent something Canelo has never faced. Canelo’s resume boast names such as Cotto, Mayweahter, Lara, etc. Of all the big names he has faced, not one of them offer the same level of threat as arguably the sports purest ‘boogeyman’. Golovkin will force every ounce of fight and talent out of Canelo, including that in which he never knew he had. 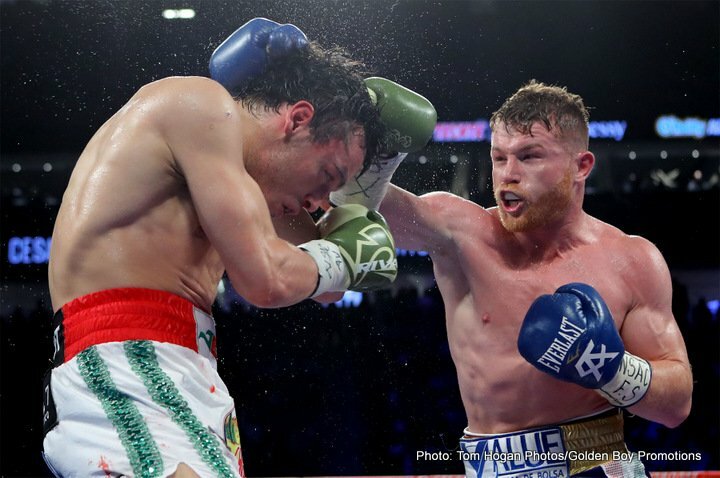 No one can argue that Canelo isn’t the more skilled of the two. But everyone can attest that it simply doesn’t matter. Any Golovkin mission is a battle of attrition. Nothing matters more than whether or not you have the ability to walk through the fire and stay on the wire! For Canelo, the same holds true. Can you outlast this ‘nightmare’? Can he walk through the fire long enough to put it out? All questions raised will soon be questions answered. I don’t know who wins, but like you, I can’t wait to find out! Stay tuned…. Isidro H. (Queens, NYC): As a fight fan of Mexican descent, I’m a huge Saul Alvarez fan. I read a comment of yours prior to the Chavez Jr. bout on your Facebook thread where you stated that Canelo is actually “higher on the P4P list than Golovkin”. Can you expand on those thoughts for those who don’t agree? Styles make fights. And Canelo has found a way to conquer all of those styles. Miguel Cotto is still better than 85-90% of the men in his division that you would put him up against. The Lara fight was considered “close” to most. My question? How many Lara fights (against elite opponents) weren’t? We said the same thing about his fight with Williams and others. Can we name a fighter in the sport who would win definitively against a guy like Lara? Can we even say that Golovkin wins definitively against Lara? I think Canelo has taken a lot of unnecessary slack. Some warranted, yet exaggerated; some just flat out wrong. But no matter how you want to project your argument, I think without question we can agree that Canelo is a more accomplished fighter than Golovkin. Defeating Canelo would help his cause, but I’m not so sure that alone changes it. Marcus S. (Oakland, CA): What do you think prevents American fight fans from supporting Deontay Wilder the way the UK fans support Joshua? Vito W. (ESB): America has changed quite a bit since the days of Ali, Foreman, and others. In those days, the country was at a totally different point, fighting totally different issues, and making totally different strides. Fast forward to this era, and the advancement of the country in many ways contributes to the difficult path fighters face trying to get their ‘shine’ in modern times. Not only this, but to be very honest, for the longest, there was just no reason to follow the Heavyweight division. Ali, Tyson, and many of yesteryear’s American legends had the type of personality that sold them both inside and outside of the ring. Today, the closest thing we’ve seen to that is the questionably retired Floyd Mayweather. What I like about Deontay Wilder is the fact that really, all he needs is a bit more exposure. He has the personality, the charisma, and the star power to draw fans from many different stretches of life. The only thing he needs is the opportunity. In Deontay Wilder, there are many things about him and his story that would make him a good ‘character’ to follow in the sport. And when you shift to the ring itself, no one can question that he actually comes to win and bring his best fight! Joshua is another one of those personalities. These guys are great for the sport and seeing them surface like they have will only help bring more talents like them to the gym and ultimately, your living room television set. Americans will always love the NBA and the NFL. But there’s definitely room for a modern day heavyweight. Who doesn’t like a strong punch that comes with a strong smile? You are here: Home / Boxing News / Left-Hook Lounge Mailbag: Featuring Canelo, Golovkin, & Deontay Wilder!